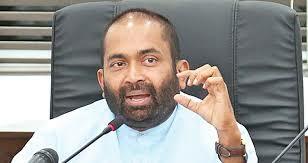 The government will not increase the electricity tariff or impose power cuts, Power and Renewable Energy Minister Ranjith Siyambalapitiya said. He said there could be a crisis in power generation in future due to the low rain fall this year. He asked consumers to use electricity with responsibility. Minister Siyambalapitiya made these observations at a press conference held at the Power and Renewable Energy Ministry auditorium yesterday. consumers should reduce power consumption and reduce their electricity bills due to this. He said last year, hydroelectricity contributed 75 percent of the national power requirement whereas this year, hydroelectricity contributed only 25 percent. “People query if we would impose power cuts and our answer is ‘no’,” Minister Siyabalapitiya said. “We are ready to face such a situation without imposing power cuts and increasing power prices. We get electricity at a competitive prices. We have around 4,000 MW capacity. There is an additional requirement of 3,200 MW,”he said. He said it would be better if power could be generated by way of renewable energy. He said the government is taking measures to generate a considerable proportion of electricity through renewable energy under the Soorya Bala Sangramaya project. Power and Renewable Energy Deputy Minister Ajith P. Perera said although the Western Province experienced rain this year, the rest of the country did not get enough rain. He said the decision to stop the Sampur Coal Power plant was a political decision. “A Presidential Task Force will be set up next year for power conservation,” Deputy Minister Perera said.